A friend of mine once told me that she loathed tomato sauce or ketchup. Curious about the statement, I had to ask "Well what do you eat with sausage rolls, burgers or pies?". She answered that she ate tomato sauce. I had to explain that with the exception of Mama June from Honey Boo Boo (who has bigger problems at the moment than ketchup sketti), that's how a lot of people eat it. It's generally an addition to something, a saucy, tangy counterpoint. But have you ever tried a dollop of it by itself? I did a couple of weeks ago and it was actually really strange stuff. Slightly artificial with an odd sweetness I recoiled when I tried it on its own. Mr NQN just screwed up his face and said "yuck". This is of course the sauce that I had been happily serving with sausage rolls at picnics, on burgers and on pies. When you mix it with something tasty the flavour is masked but on its own it is pretty unimpressive stuff. But what if you could make your own really good stuff? 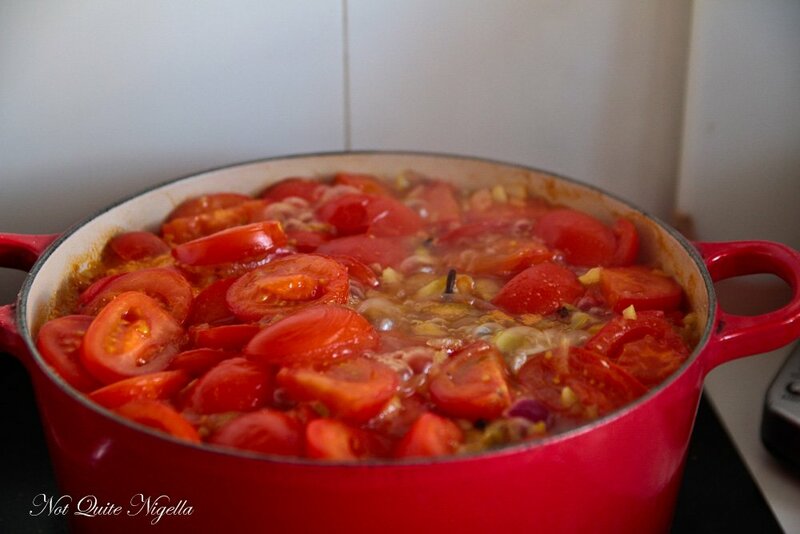 I was recently at chef Constanza Latorre's house and she offered me some of her home made tomato sauce. I tried it. It was incredible. Bursting with flavour I wanted more. She kindly furnished me with the recipe and I decided that this would be one of my edible Christmas gifts. Every year I make a few things to give to friends. And while some may scoff at giving something as inexpensive as tomato sauce, once they try it, they may end up reconsidering. 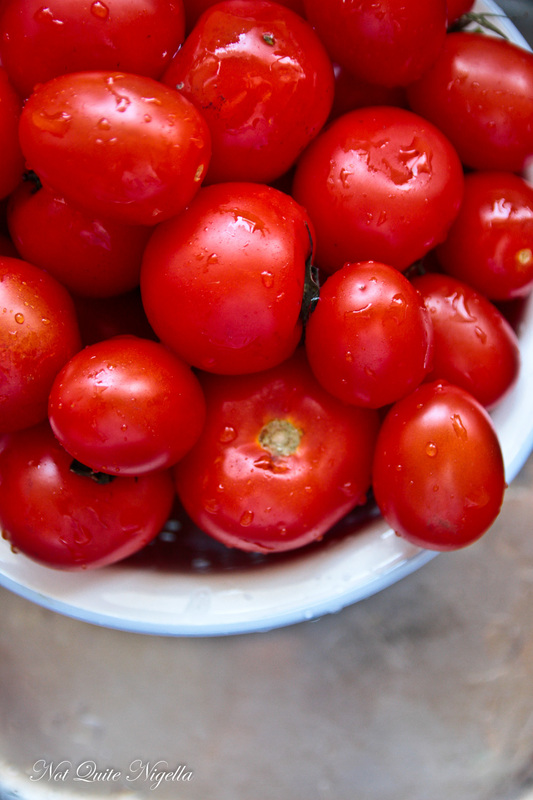 In this recipe, summer ripened tomatoes are cooked for three hours with onion, apples, spices, vinegar and seasonings. This mix is blitzed, strained and then cooked again. I actually adapted Constanza's recipe originally from "The Aunt Daisy Cookbook with Household Hints" as I misread it. I left out the allspice and forgot to put the cloves in a muslin bag (clearly I was having a challenging day). I also didn't have enough brown sugar - the original recipe called for almost 1 kilo or 2 pounds of sugar but I think the lesser amount worked perfectly. It is a long process but you really don't have to do much during the three hours. And the end result is really so worth it! It is absolutely worth gifting or you might be tempted like me just to keep it at home. So tell me Dear Reader, have you ever tried tomato sauce or ketchup by itself? What brand do you have in your fridge? And what do you usually eat it with? Step 1 - Saute the onions in the oil in a large pot. Add the rest of the ingredients except for the sugar. Simmer on medium heat with the lid on for 3 hours. 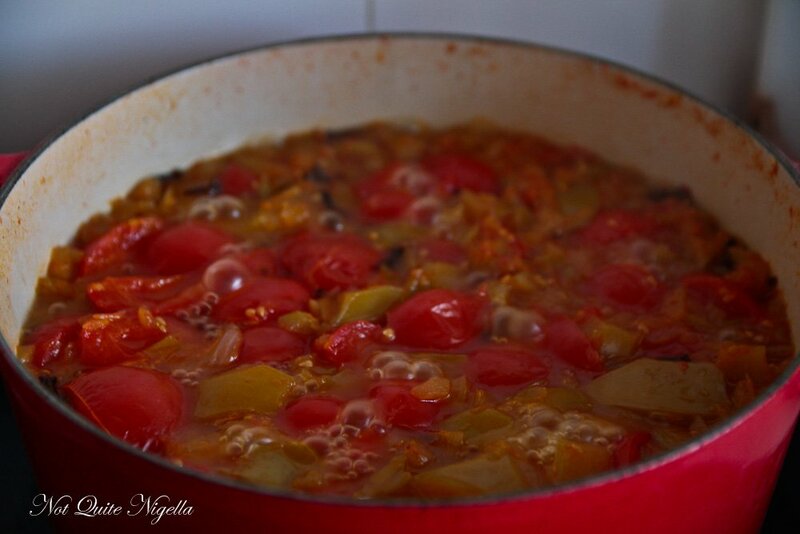 Check on it every hour and stir it around and in the last hour add the sugar and press the tomatoes so they are all squashed. Step 2 - Remove from heat and blitz with an immersion blender. 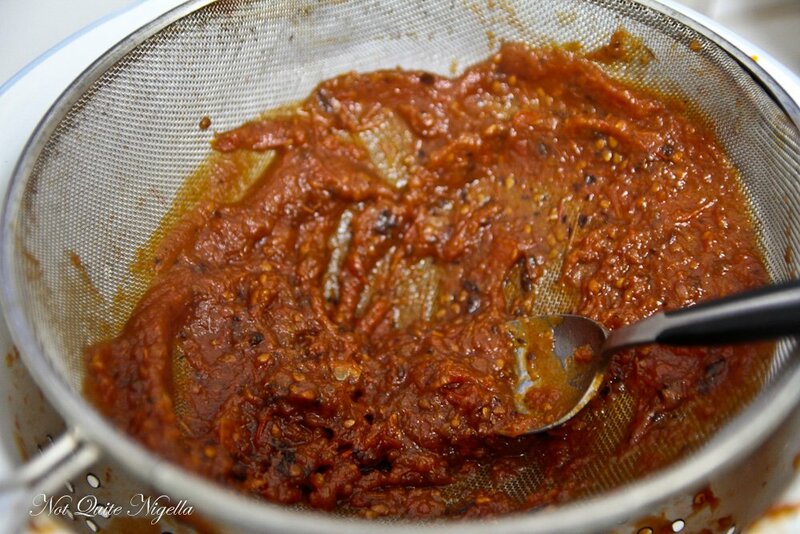 Pass through a fine sieve pressing down so get all of the flavour and liquid out of the skins and seeds. I ended up with about 1/4 cup of skin and seeds by the end as I pressed once and pressed the residue one more time. Don't discard the skins and seeds - they are actually really flavoursome and Mr NQN commented that they were delicious in his sandwich (and he rarely comments about his lunch!). 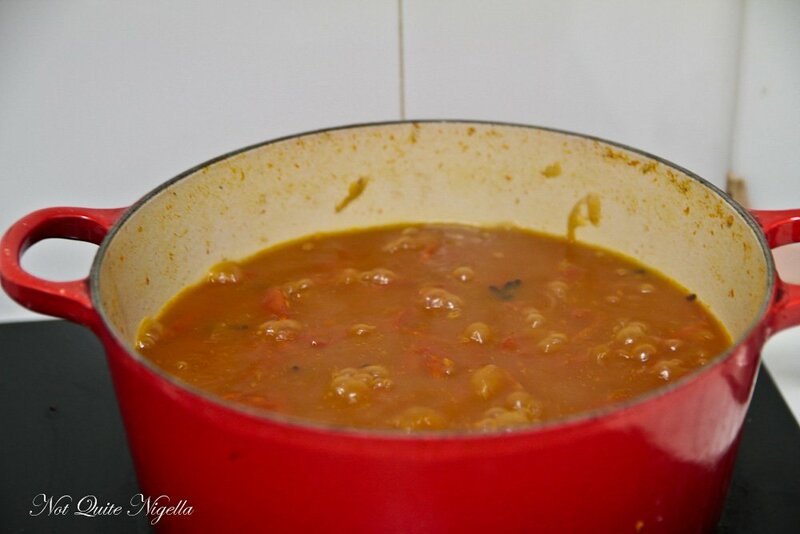 Step 3 - Place back on the heat and simmer with the lid on for 30 minutes-taste this now for flavour and add more sugar if needed. The original recipe calls for more than three times the amount of sugar but both Mr NQN and I loved it with less. 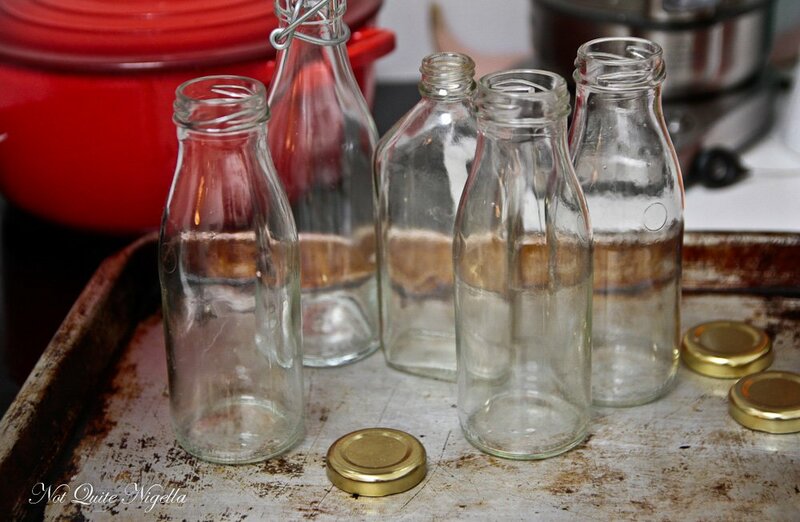 Meanwhile, sterilise your bottles and lids. I made a big mistake when I took off the rubber stopper but left the plastic bit on. Well it melts so use metal lids and glass bottles. Wash thoroughly and place on a baking tray in a 180C/350F oven for 10 minutes. 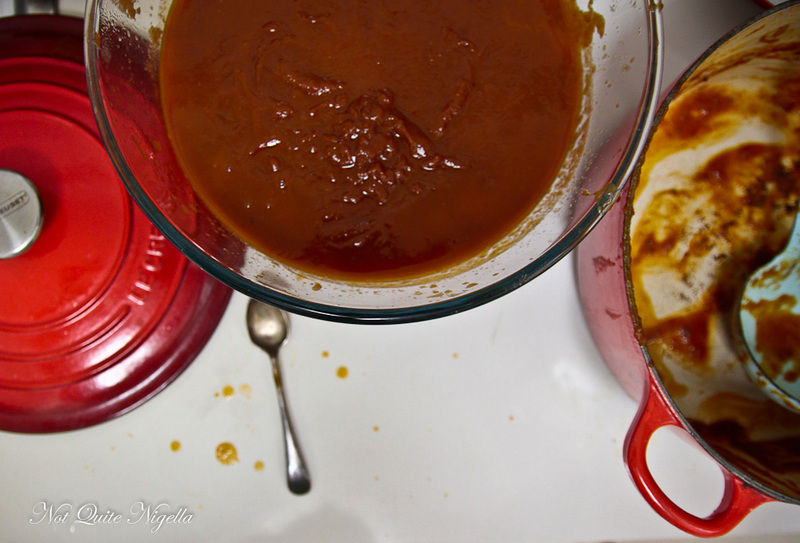 Step 4 - When the sauce is ready, carefully remove the hot bottles and lids from the oven and place a funnel over the opening and ladle in the sauce. 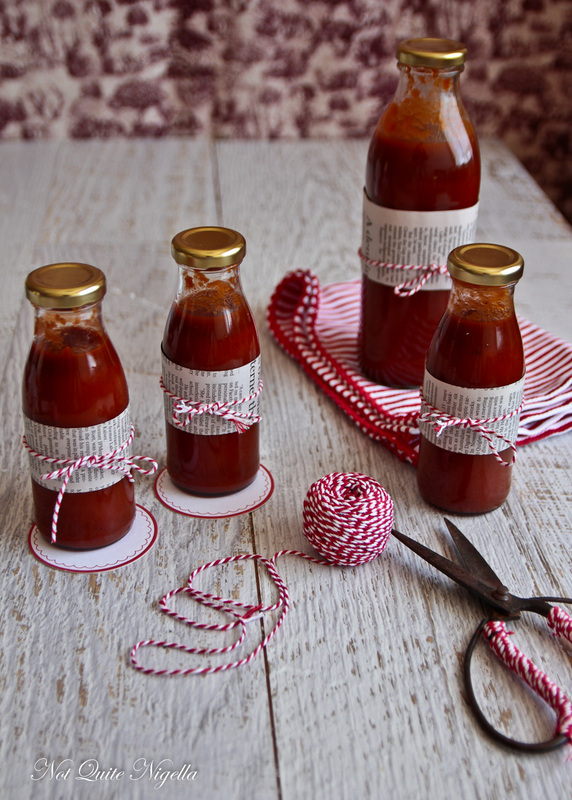 Be careful not to use cold or room temperature bottles, the hot sauce will cause the bottles to crack due to the temperature difference. Leave 3/4 of inch or so space on top. 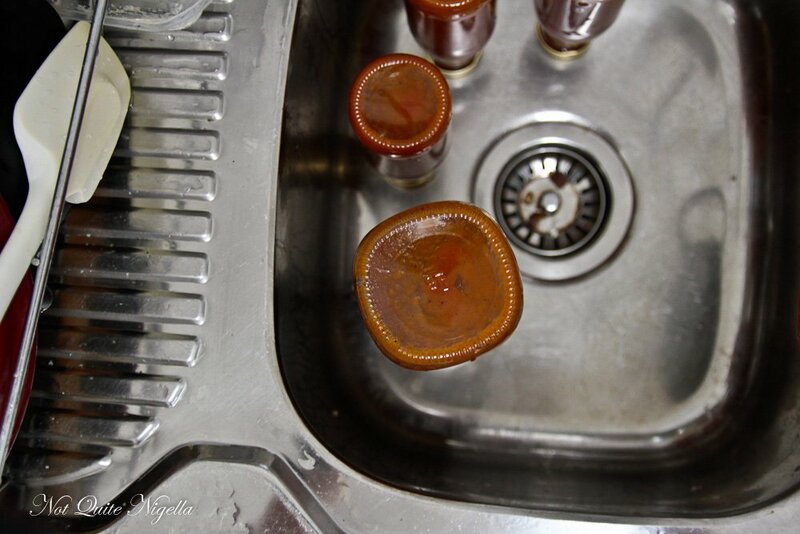 Using gloves, seal the lid on tight and then place in the sink upside down for 10-15 minutes. This will create a seal. 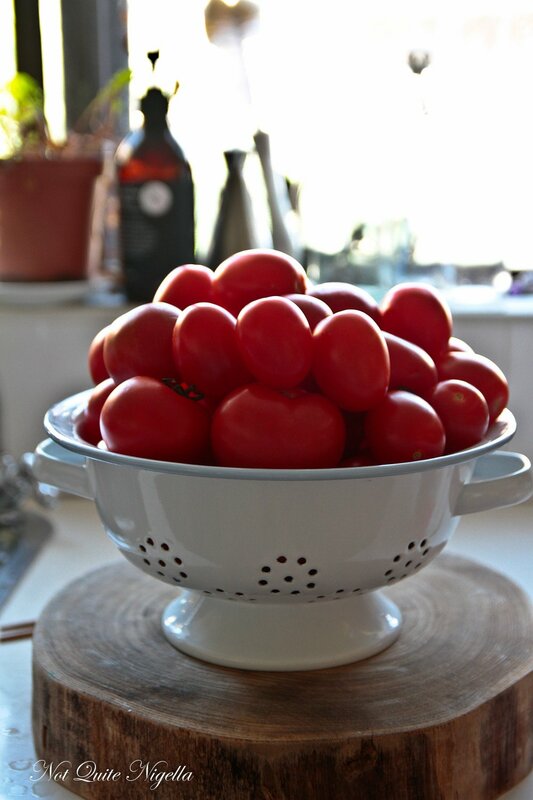 After 15 minutes, if the metal lid doesn't press down then you've got a seal and you now have your own home made tomato sauce that doesn't need refrigeration so you can give it to friends! It will last up to a year in the pantry but once opened you will need to refrigerate it. recipeBaking Hacks: How To Make Buttery Layered Puff Pastry in 15 Minutes! recipePumpkin Spice Buttermilk Pancake Mix - DIY Christmas Gifting! recipeMake Your Own Ramen From Scratch! recipeMake Your Own Mega Family Sized Chocolate Bar With Easter Egg Leftovers & An Ice Cube Tray! recipeA Beautiful Day For Passata Day! recipe Baking Hacks: How To Make Buttery Layered Puff Pastry in 15 Minutes! recipe Pumpkin Spice Buttermilk Pancake Mix - DIY Christmas Gifting! recipe Make Your Own Ramen From Scratch! recipe Make Your Own Mega Family Sized Chocolate Bar With Easter Egg Leftovers & An Ice Cube Tray! 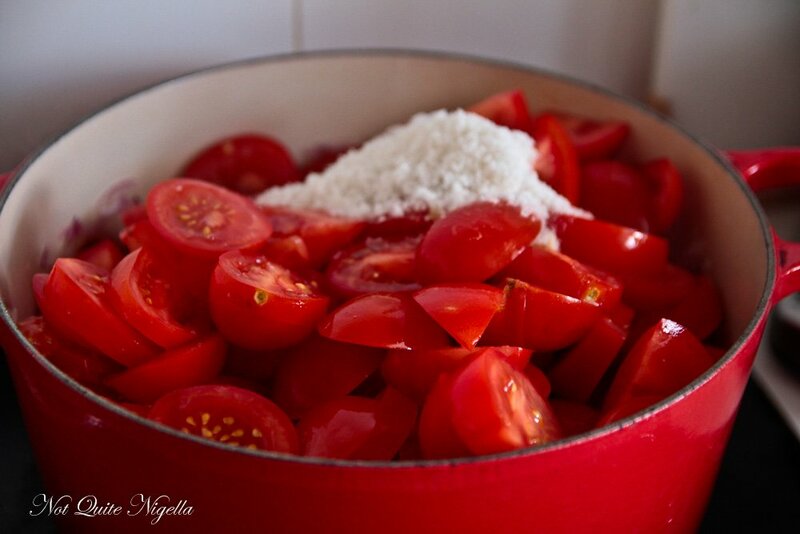 recipe A Beautiful Day For Passata Day!